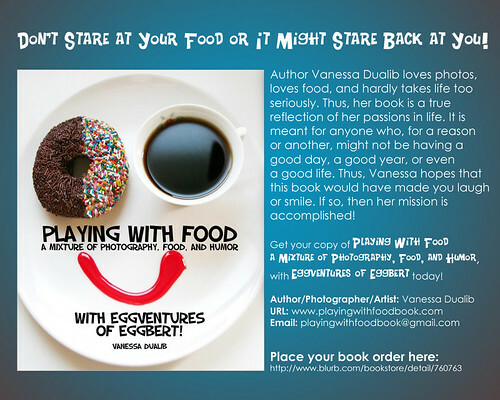 'Playing With Food' Book Now Available! Check out the book PREVIEW. Or order your copy HERE! Playing: with my food! Always. ... cleverly disguised as a responsable adult! Favourite photographer: None in particular. I love the shots not the photographers. If it surprises me, then I'm a fan. Personal Quote: "I think the next best thing to solving a problem is finding some humor in it." Favorite visual artist Norman Rockwell Favorite movies 'Evening' Favorite bands / musical artists Bilie Holiday Favorite writers Fernando Pessoa Favorite games Pirates! Other Interests Some unusual stuff, some boring stuff... just like everybody else I guess. So, I have just spend about half hour just staring at your works. They are amazing and really original, I love them! Keep up the good work! Hi there Naddi. Thank you for stopping by and taking the time to check out some of my creations. If 'my gang' got a smile out of you, then my mission was accomplished! They are completely amazing. I thank you and wish you a loads of more creative ideas like these that will make people's days brighter. You are a wonderful artist and I hope your works always get a lot of attention they deserve! Keep up the awesome work~! Thanks Crystallyna! I'm really glad to know you enjoy some of my creations. I actually have a lot of fun cretng then as well.